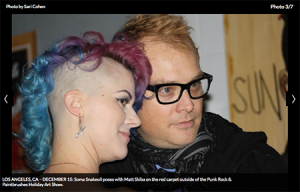 Punk rock royalty came bearing more than their usual instruments on Dec. 15, when the worlds of music and art collided for Romantic Rock’s Punk Rock & Paintbrushes Holiday Art Show. The spacious setting in Downtown, Los Angeles, housed dozens of original pieces created by a variety of artists. The group art exhibition featured work by Alkaline Trio and Blink-182’s Matt Skiba, Jurassic 5’s Chali 2na, Flogging Molly and legendary skateboarder Matt Hensley, AFI’s Hunter Burgan, The Vandals’ Warren Fitzgerald, Bad Cop/Bad Cop’s Jennie Cotterill, Eagles of Death Metal’s Jesse Hughes, world-renowned skateboarder Steve Caballero, along with artists Natalia Fabia, Hunter Freese, Danny Greene, Paul Kobriger and Soma Snakeoil.